A lot of people think vegetarian and vegan cuisine is boring or not filling. But let me tell you, despite the fact that I do eat a fair amount of meat, I’ve had some deliciously belly-stuffing vegan meals in my day. One of them that I look back on with particular fondness is a sous-vide cauliflower “steak” that was hearty, full of fall flavors and so darn satisfying. So when I saw this Togarashi Grilled Cauliflower with Grilled Spring Onions and Plums recipe from Becky Reams, I knew it was a must-share recipe. 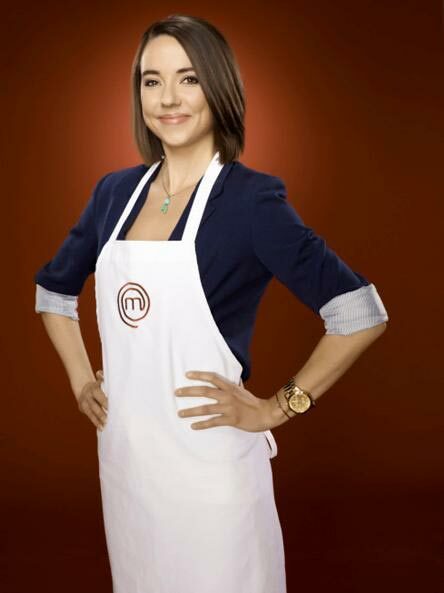 Becky is headlining the MasterChef cruise, alongside other MasterChef celeb chefs, and is on MasterChef Mondays on FOX at 8 p.m. Eastern/7 p.m. Central. Could you share a few thoughts on how/why you came up with your recipe? I love ribs, growing up in Kansas City, but not everyone has the means to slow smoke pork ribs for seven to eight hours. This recipe I devised for folks who don’t have a smoker but also want tasty ribs at home. The sauce and treatment is Korean-inspired, as that is a cuisine I greatly enjoy eating, and cooking. The cauliflower and plum dish is something I came up with to be vegetarian, but with big bold flavors — something to satisfy carnivores and vegetarians alike. It’s seasonal, and packed with flavor from the grilling of the plums and the cauliflower. Lots of fresh herbs, and the togarashi gives it a little unexpected kick. Why is this recipe so healthy? When you cook in your own kitchen, with your own hands, it’s always healthier than dining out. You know what you’re putting into it, pure and simple. In my recipes, the vegetables are treated rather simply, with a few key flavor players, like mint, cilantro, scallions, bright citrus and spicy chiles. To create healthy dishes, I like to eat fresh and seasonal, and always pack in lots of flavor with fresh herbs, spicy chiles and citrus. 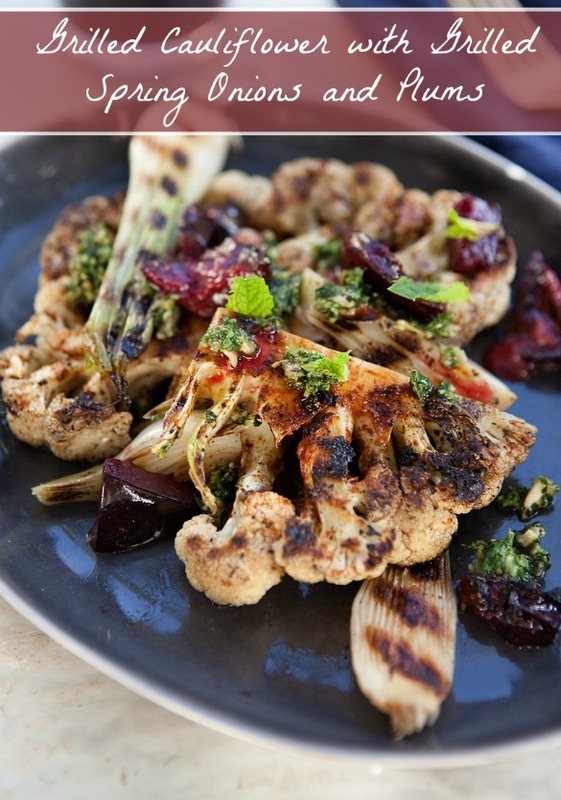 And now let’s share that yummy Grilled Cauliflower with Grilled Spring Onions and Plums recipe! Cauliflower steaks are marinated in olive oil with smoked paprika and togarashi before being grilled with beautiful spring onions and black plums. The grilled sweet and tart plums transform into a natural agrodulce . Brightened up by a quick sunflower seed, mint and garlic pesto, of sorts. Pour ½ cup olive oil into a bowl and whisk in salt to taste, togarashi and paprika. Slice onions in half, and slice cauliflower into steaks (planks), through the middle of the head. Add to the olive oil/spice marinade. Preheat indoor or outdoor grill to high heat, and clean grill grates. When hot, add onions and cauliflower and grill on each side 3 to 4 minutes until lightly charred. Remove from the grill when done, and set aside. In a small food processor, combine garlic cloves, cilantro, mint (reserve a few mint leaves for garnish later), sunflower seeds and salt to taste. Pulse 7 to 8 times, until ground up and mealy. Add 4 to 5 tablespoons of olive oil and pulse again, to get a thick pesto-like consistency. To plate the dish: Layer onions and cauliflower on a plate or platter (if serving family style), sprinkle around grilled plums and herb sauce, garnish with fresh mint leaves and drizzle with olive oil. Enjoy! Recipe reprinted with permission by Becky Reams.